The Tools4MSP Geoplatform (former ADRIPLAN Portal) is a community-based, open source portal based on GeoNode, a web-based Content Management System (CMS) for developing geospatial information systems (GIS) and for deploying spatial data infrastructure (SDI). It includes over 600 geospatial datasets, organised in the following categories: coastal defence and sand extraction, energy, environmental protection, environment and ecosystem, fisheries and aquaculture, maritime transport and tourism, miscellanea. The Geoplatform capitalizes data from other projects (e.g. Shape, CocoNet) and enables access to standard services from other geoportals (e.g. EMODnet, EU Sea Atlas). 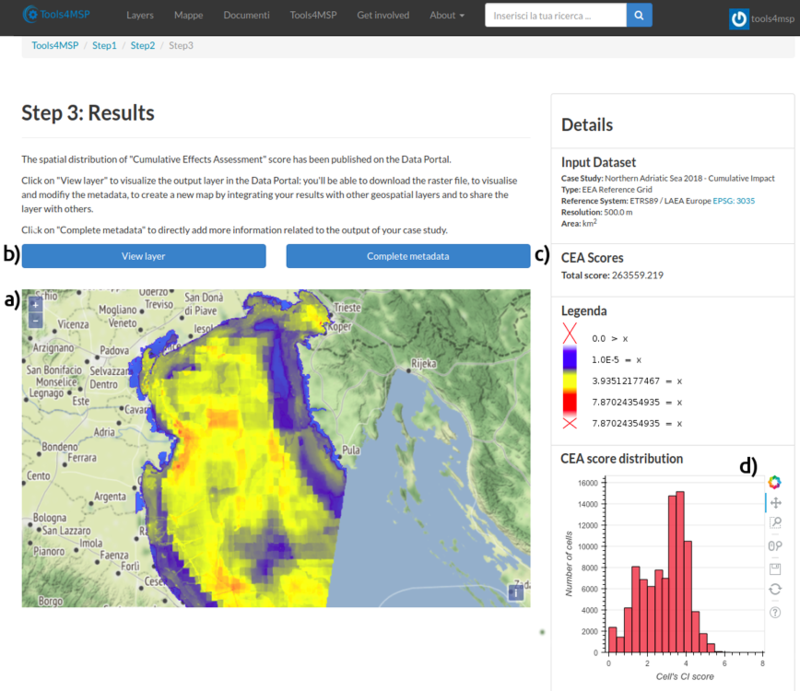 Moreover the Geoplatform provides a set of MSP-oriented web-tools such as Cumulative Effects Assessment (CEA), Marine Use Conflict Analysis and a Marine Ecosystem Services Threat (MES-Threat) Analysis. The Tools4MSP Geoplatform is regularly updated by the Tools4MSP Development Team, the original version was developed in the context of the ADRIPLAN Project and has been consolidated within the Italian RITMARE Flagship Project and by ongoing projects such as SUPREME. Core functionalities of CEA/MUC have been supported by an MSP pilot study in sea areas of Emilia-Romagna Region (Italy), and incorporated as case studies analyses within the SUPREME (Supporting maritime spatial Planning in the Eastern Mediterranean) and SIMWESTMED (Supporting Maritime Spatial Planning in the Western Mediterranean region) projects. Currently the web-tools are providing core functionalities within PORTODIMARE (geoPortal of Tools & Data for sustainable Management of coAstal and maRine Environment; 2018-2020) Project. ● What are the most relevant spatial data stocktake to be considered at different spatial scales (regional, national and macro-regional) to support MSP implementation, also considering a cross-border perspective? ● How MSP relevant spatial data can be efficiently managed and shared among users and with other web data tools and platforms? ● How can previous projects and initiatives on MSP-related data management be capitalized? ● What are the cumulative impacts of human activities on the environment? ● What are the levels of conflicts among different maritime uses? ● What are the marine ecosystem services at higher risk? The Tools4MSP Geoplatform is one of the reference tool for MSP-oriented data and knowledge sharing. It is currently implemented within the Adriatic-Ionian Sea, but its functionalities are applicable also within other European Seas The Geoplatform is actively developed and updated by the Tools4MSP Development Team (Italian National Research Council - Institute of Marine Sciences; CNR-ISMAR) capitalizing outcome of ongoing (SUPREME and PORTODIMARE) and past projects (RITMARE, ADRIPLAN). The Geoplatform incorporates multiple functionalities for data storage, discovery, MSP-oriented geospatial web-tools application and the sharing of datasets and results by and for different user-communities. ● Promoting the open access to information and tools using standard open licenses. The Tools4MSP Geoplatform is based on the GeoNode software, a web-based Content Management System (CMS) for developing geospatial information systems (GIS) and for deploying spatial data infrastructures (SDI). The Geoplatform provides an operational set of web-tools that can assist decision-makers and strategists in the development of MSP-oriented geospatial analysis in support of planning, environmental management or conservation prioritization. The web-tools is based on the Tools4MSP modelling framework (Depellegrin et al., 2017, Menegon et al., 2016). 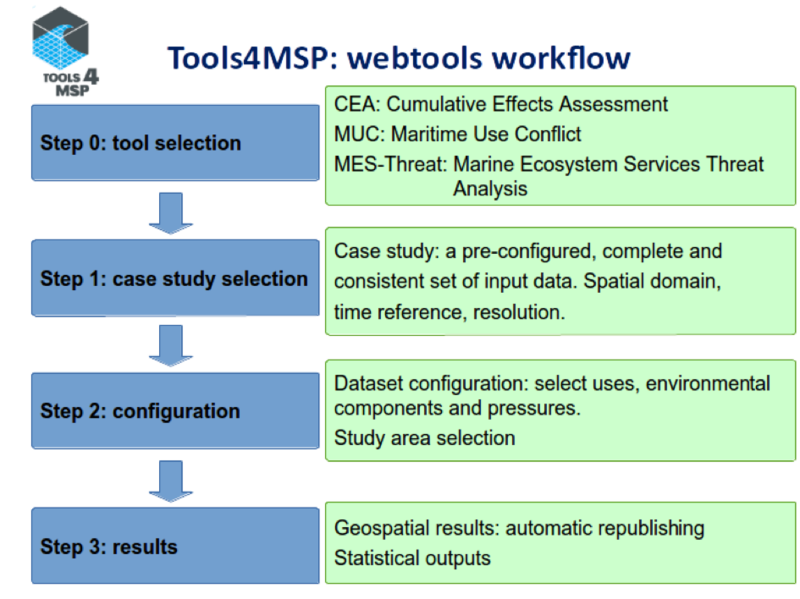 The web-tools can be used through a Graphical User Interface (GUI) using stepwise procedure for geospatial modelling of Cumulative Effects Assessment (CEA), Maritime Use Conflict (MUC) Analysis and Marine Ecosystem Services Threat (MES-Threat) analysis. Geospatial datasets are continuously upgraded by the Tools4MSP Development Team and within recent (RITMARE and SUPREME) and past (ADRIPLAN) project activities. The Geoplatform benefits from multiple data sources and data providers, starting from the project’s partners, including other local, regional and national administrations, and capitalizing the great work done in already available data portals (e.g. European Atlas of the Seas, EEA data portals, SeaDataNet, EMODNET, etc.) and past projects (e.g. SHAPE, CoCoNet, MAREA-MEDISEH, etc.). The geospatially-enabled web-tools incorporated in the Geoplatform provide a user friendly environment and a stepwise workflow enabling user to perform customized analysis for the built-in CEA, MUC and MES-Threat Analysis. Cumulative effects assessment is based on current assessment standards such as implemented around the globe (Halpern et al. 2008, Andersen et al. 2013), but has been further extended to incorporate a distance model to propagate the pressures. The CEA implemented as webtool on the Geoplatform, considers an additive effects combination, where the final CEA score corresponds to the sum of individual effects exerted by anthropogenic activities on an environmental component. Also, the CEA considers a linear response of the environmental component to the pressure. For information on a more advanced CEA implementation we refer to Menegon et al. (2018a, accepted). Maritime Use Conflict analysis is based on a methodology developed within the COEXIST Project. In more detail the method proposed by Gramolini et al. (2010) allows the identification of geospatial conflicts in marine areas using expert based judgement to characterize anthropogenic activities through different attributes (vertical scale, spatial domain, temporal domain and mobility). Marine Ecosystem Services Threat (MES-Threat) analysis assesses the risk of loss or impairment of use of Marine Ecosystem Services provided by EUNIS Seabed Habitats. MES-Threat incorporates the MES supply capacity based on MES Matrix developed by Galparsoro et al. (2014) implemented for the Adriatic Sea by Depellegrin et al. (2017) with CEA technology to generate a novel index. Results allow to incorporate the socio-ecological dimension on CEA analysis and promote a better identification of conservation measures and potential restoration needs. ● Step 1: Case study selection: The user can select the area of interest for the web-tools application. ● Step 2: Dataset configuration: The user can select the environmental components, human activities and MSFD pressure for the model run. ● Step 3: Results & Outputs: The user can view, explore, share, document and download geospatial and statistical results of the model run. The web-tools are released as Free and Open Source Software (FOSS) and the package can be reused as GeoNode plugin or as stand-alone library independently from the GeoNode software to perform advanced analysis. The Tools4MSP Package is a python-based open source library that implements the algorithms for CEA/MUC geospatial modelling (Menegon et al., 2016). In its latest version Tools4MSP Package can be downloaded from GitHub. An example of Graphical User Interface representing results of web-tools application is presented in the Figure below, illustrating the (a) geospatial outputs for CEA modelling, (b) view layer button enabling users to download geospatial results in GeoTiff format, (c) complete metadata button supporting metadata description of results by the user and (d) statistical result in terms of distribution of CEA score by number of cells. 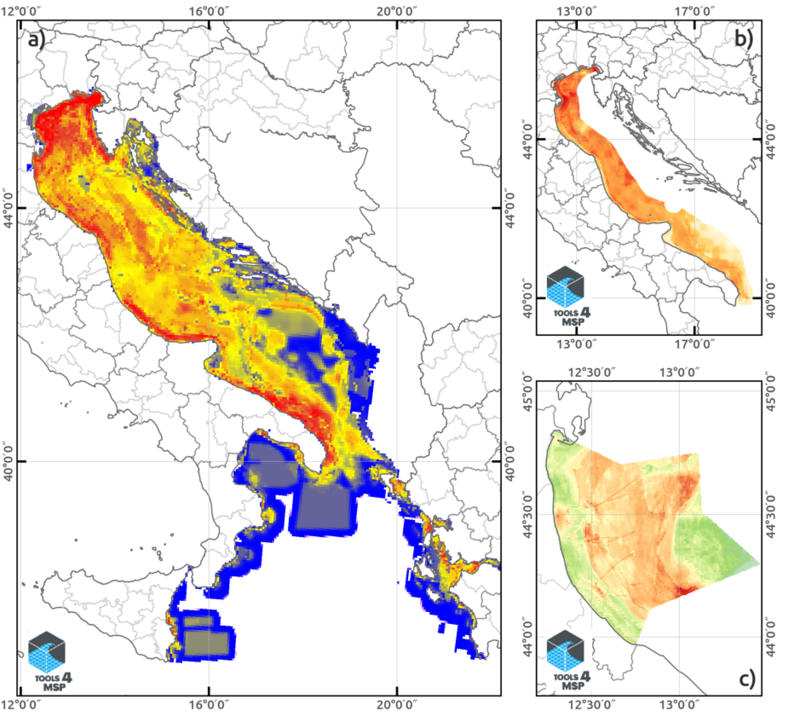 The following figure illustrates an example for the Northern Adriatic Sea of a full set of geospatial results of the web-tools presented using a dedicated GIS software, such as QGIS (QGIS, 2018). Figure can be defined as follows: (a) CEA results using an additive effect model, based on an isotropic convolution as distance model, (b) presentation of Maritime Use Conflicts (MUC) analysis based on the COEXIST methodologies and (c) application of the Marine Ecosystem Services Threat (MES-Threat) analysis describing the risk to ecosystem services loss or impairment resulting from cumulative anthropogenic impacts. 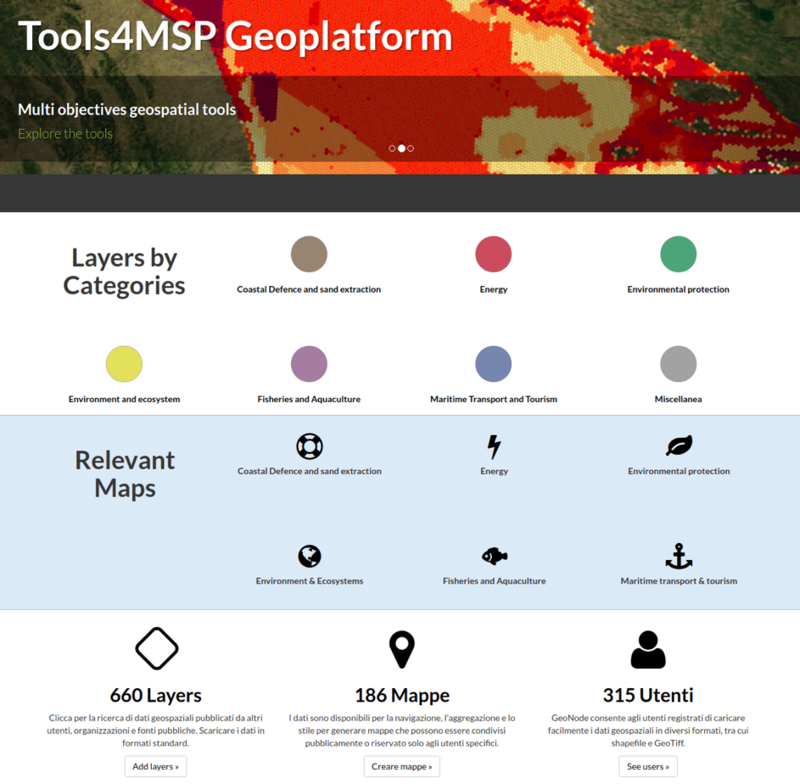 The Tools4MSP Geoplatform adopts a collaborative approach that allows to be utilized at different spatial scales. In particular, the CEA/MUC modelling framework with updated datasets and algorithms has been transferred on a multitude geographical areas: on regional scale (Barbanti et al., 2017), models were applied in Emilia-Romagna Region in the context of an institutional collaboration agreement for study and research among the Regional Department of Land and Environmental Department and CNR-ISMAR (Regional decision DG 2274/2016). On macroregional level, models were applied with advanced CEA/MUC algorithms within the RITMARE Project, with applications in the Adriatic (Depellegrin et al., 2017) and Italian Adriatic Sea (Menegon et al., 2018a, accepted). Modelling techniques and web-tools within the Tools4MSP Geoplatform are continuously developed and regularly updated by the Tools4MSP Development Team, a multidisciplinary researcher group composed by policy experts, ICZM-MSP experts, ecologists, data and GIS specialists, modellers and software engineers. Currently the Tools4MSP has been adopted to support the case study implementation for the SUPREME project (North-Adriatic case study) and SIMWESTMED project (Sicily-Malta Channel and Tuscany Archipelago case studies). In the near future further CEA/MUC model advancements will be operated within the PORTODIMARE Project. Funding Source: the Tools4MSP Geoportal was developed by the Flagship Project RITMARE - Italian Research for the Sea, coordinated by the Italian National Research Council and funded by the Italian Ministry of Education, University and Research within the National Research Program 2012–2016. Costs: not possible to be defined, as part of the overall funds to the RITMARE Project. Andersen, J.H., Stock, A., Heinänen, S., Mannerla, M., Vinther, M., 2013. Human uses, pressures and impacts in the eastern North Sea (Technical Report from DCE – Danish Centre for Environment and Energy No. 18). Barbanti, A., Sarretta, A., Venier, C., Bellaciccio, S., Depellegrin, D., Farella, G., Menegon, S., Lorito, S., Grati, F., Bolognini, L., Perini, L., 2017. Sviluppo ed analisi di proposte di ICZM-MSP In aree specifiche: costa emiliano-romagnola. Zenodo. Gramolini, R., Grati, F., Fabi, G., Schule, T., 2010. GRID GeoReference Interactions Database. Deliverable D3.9. COEXIST Project. Interaction in coastal waters: A roadmap to sustainable integration of aquaculture and fisheries. Menegon, S., Sarretta, A., Barbanti, A., Gissi, E., Venier, C., 2016. Open source tools to support Integrated Coastal Management and Maritime Spatial Planning. PeerJ Preprints.